Shut up and take my money! 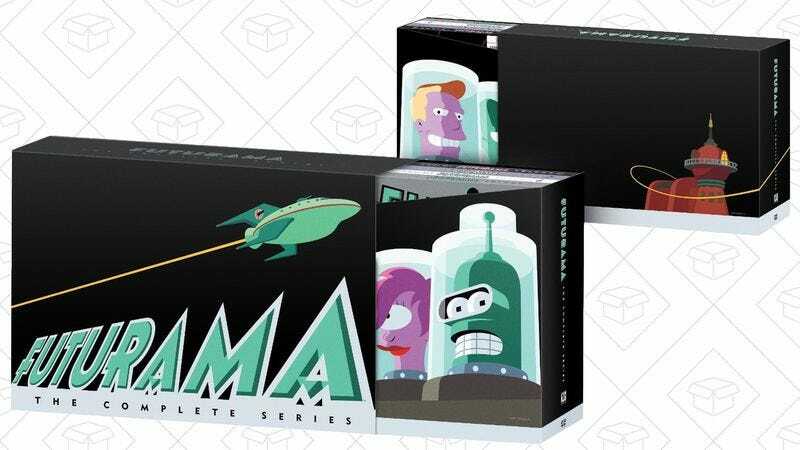 Unfortunately, the complete Futurama box set isn’t on Blu-ray, but the DVD set has never been this cheap before. It’s a Gold Box deal though, so grab it quickly before it sells out. External Bluetooth transmitters and receivers with 3.5-mm jacks have been around for years, but Etekcity’s new model raises the bar with support for optical (SPDIF) audio. The little box can both receive and transmit Bluetooth signals, and includes SPDIF in and out ports to connect it to your TV or high-end audio equipment. Plus, it can even pair to two sets of headphones simultaneously when transmitting, which would allow two people to, say, listen to the same TV over headphones to avoid waking up someone in the next room. Just be sure to use promo code 65ML8Y3V at checkout to save a few bucks. Most laptops don’t have CD drives anymore, which is mostly fine, except for now and then when you inevitably wish you had one. Now, you can for just $21, no extra power cable required. Today only, Amazon’s offering the best price ever on a nearly perfectly reviewed DeWalt lithium-ion combo kit as part of a Gold Box deal. $179 gets you a brushless impact driver, a drill/driver, a tool bag, and a pair of rechargeable batteries. That’s still not exactly cheap, but it’s $80 less than usual, and more than $20 less than a Gold Box deal Amazon ran on it last year. But just remember that this deal is only available today, or until sold out, so don’t get screwed. Just when you thought you’d seen it all in the world of desk lamps, Aukey’s discounting one that folds up to fit in your pocket and includes a battery to run for a few hours untethered from the wall. You can set this thing up so many different ways. This is a solid modular garden set for those of you with green thumbs, and its two-foot height ensures easy, comfortable maintenance.